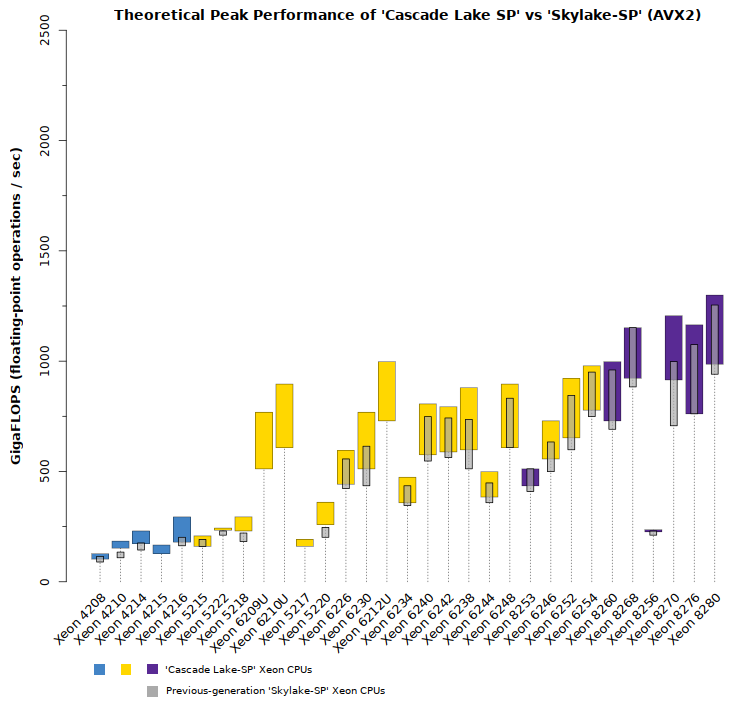 With the launch of the latest Intel Xeon Scalable processors (previously code-named “Cascade Lake SP”), a new standard is set for high performance computing hardware. These latest Xeon CPUs bring increased core counts, faster memory, and faster clock speeds. They are compatible with the existing workstation and server platforms that have been shipping since mid-2017. Starting today, Microway is shipping these new CPUs across our entire line of turn-key Xeon workstations, systems, and clusters. In the diagram above, the wide colored bars indicate the price performance of these new Xeon CPUs. 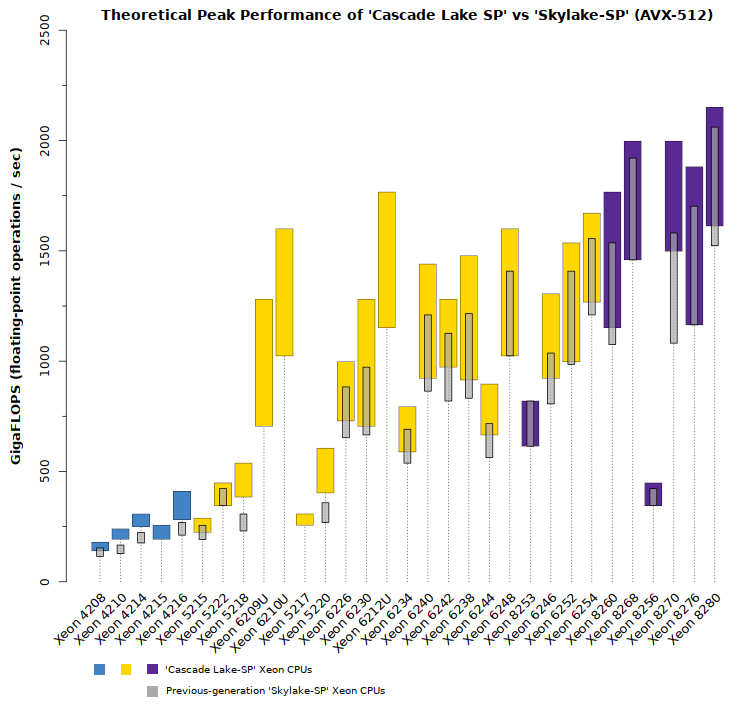 The dots indicate the price performance of the previous generation, which allows us to compare the two generations SKU by SKU (though a few of the newer models do not have previous-generation counterparts). 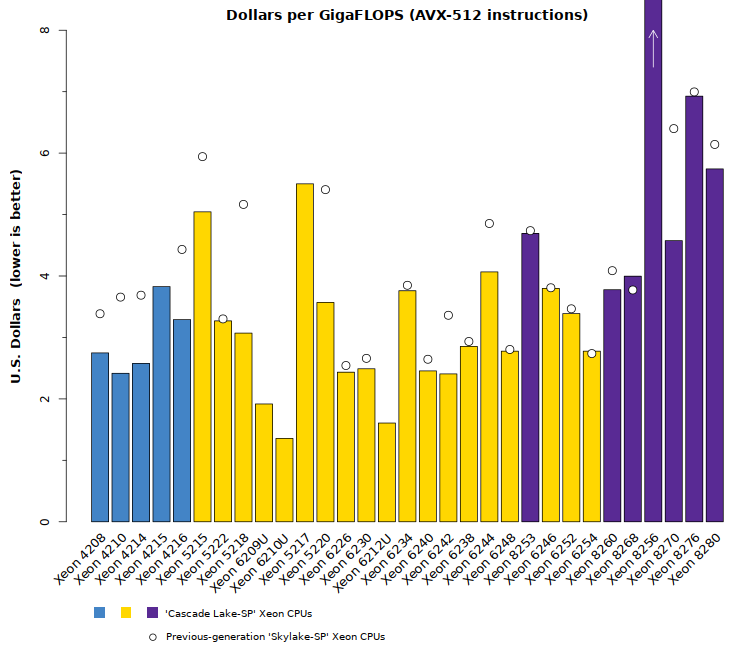 In this comparison, lower values are better and indicate a higher quantity of computation per dollar spent. To summarize: this latest generation will provide more performance for the same cost if you stick with the model numbers you’ve been using. In the next section, we’ll review opportunities for cost reduction. With generational improvements, it’s not unusual for a new CPU to replace a higher-end version of the older generation. There are many cases where this is true in the Cascade Lake Xeon CPUs, so be sure to consider if you can leverage such savings. For computationally-intensive applications, rapid access to data is critical. Thus, memory speed increases are valuable improvements. This generation of CPUs brings a 10% improvement to the Xeon 5200-series (2666MHz; up from 2400MHz) and the Xeon 6200-/8200-series (2933MHz; up from 2666MHz). This means that the Xeon 5200-series CPUs are more competitive (they’re running memory at the same speed as last generation’s Xeon 6100- and 8100-series processors). And the higher-end Xeon 6200-/8200-series CPUs have a 10% memory performance advantage over all others. While a 10% improvement may seem to be only a modest improvement, keep in mind that it’s essentially a free upgrade. Combined with the other features and improvements discussed above, you can be confident you’re making the right choice by upgrading to these newest Intel Xeon Scalable CPUs. With the official launch of Intel Optane DC Persistent Memory, it is now possible to deploy systems with multiple terabytes of system memory. Well-equipped systems provide each Xeon CPU with six Optane memory modules (alongside six standard memory modules). This results in up to 3TB of Optane memory and 1.5TB of standard DRAM per CPU! Look for more information on these possibilities as HPC sites begin adopting and exploring this new technology. The wider/colored bars indicate peak performance for the new Xeon CPUs. The slim grey bars indicate peak performance for the previous-generation Xeon CPUs. Without exception, the new CPUs are expected to outperform their predecessors. The widest margins of improvement are in the lower-end Xeon 4200- and 5200-series. The only exception to the above would be for applications which require very high clock speeds, as these single-socket CPU models do not provide base processor frequencies higher than 2.5GHz. The strength of these single-socket processors is in high throughput (via high core count) and decent clock speeds. Next Steps: get started today! If you’d like to read more about these new processors, check out our article with detailed specifications of the Intel Xeon “Cascade Lake SP” CPUs. We summarize and compare the specifications of each model, and provide guidance on which models are likely to be best suited to computationally-intensive HPC & Deep Learning applications. Groups which prefer to verify performance before making a design are encouraged to sign up for a Test Drive, which will provide you with access to bare-metal hardware with Intel Xeon Scalable CPUs, large-memory, and more. If you’re expecting to be upgrading or deploying new systems in the coming months, our experts would be happy to help you consider your options and design a custom cluster optimized to your workloads. We also help groups writing budget proposals to ensure they’re requesting the correct resources. Please get in touch!